ALOHA WELCOME THIS IS DIAMOND HEAD PLANTS WORLD WIDE ADENIUM SECTION. WE ARE THE LEADERS IN HAWAII, USA FOR ADENIUM (DESERT ROSE) HYBRIDS. HAWAII'S LARGEST ADENIUM COLLECTION IS LOCATED ON THE GROUNDS OF OUR NURSERY. WE CARRY A LARGE NUMBER OF SPECIMEN SIZE MATERIALS TO SEEDLINGS. 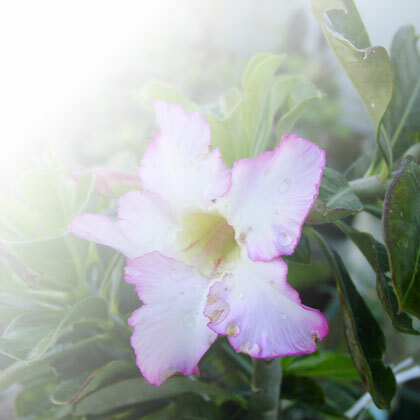 ADENIUM OBESUM AND ARABICUM ARE OUR SPECIALTIES. NOW AVAILABLE: A NEW DOUBLE YELLOW FLOWER WITH A FRAGRANCE. OTHER NEW DOUBLE FLOWER COLORS ARE HERE FOR YOUR PURCHASE. TRIPLE FLOWERS ARE COMING SOON. OUR LOCAL HYBRIDIZERS, GLENN SAITO AND NATHAN WONG CONTINUE THEIR CROSSES.THEY HAVE RECENTLY GONE INTO THE EUPHORBIA FIELDS.